This fund has been started by Great Oak High School Alumni on behalf of our dear friend and "pack member": Jeni (Kern) Bruns (Class of '08), who was recently diagnosed with Stage IV Adenocarcinoma and is beginning treatment. During her time at GOHS, Jeni played a key role in helping to shape the campus culture into what it is today. Below is Jeni's story. Let's help them focus on treatment and recovery by sharing in the bills! As the old addage goes, "many hands make light work". Little or big--whatever you are able to give--will go a long way towards helping Jeni's recovery. 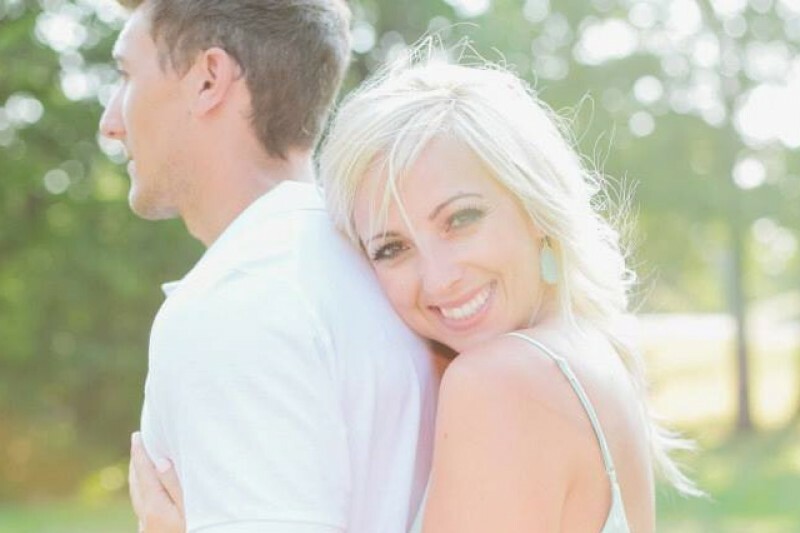 Jeni is a 26 year old Temecula, California native who moved to Edmond, OK in 2012 for graduate school and love after meeting her now husband, Adam, in Mexico. Adam is from Pawnee, Oklahoma and was attending Oklahoma State University while Jeni attended the University of Arizona in Tucson~ Jeni declares it was an easy move from Arizona to Oklahoma after meeting such kind people and seeing how much opportunity was in OKC. As a young professional with her Masters in Health and Wellness Management, Jeni has a passion for community relations and nonprofits so her current career in marketing/public relations with IBC Bank Oklahoma under great mentors who also work to better the state of Oklahoma in each community they serve is a dream come true. Jeni spends her time active in her church Life.Church, Propel Women, Miles Against Melanoma- OK, the Greater Oklahoma City Chamber, and The United Way of Central Oklahoma. Adam and Jeni just had their first baby girl, Bentley, on February 2, 2016 and have a six year old son, Boston, who shares his time between two homes in Pawnee and Edmond. They love their golden retriever and two orange kitties and spend lots of time enjoying the outdoors and making memories with friends and family. Jeni’s family (parents, four siblings, 2 siblings by beautiful marriages, 2 nephews, 1 niece) (in law parents and grandparents, four Bruns brothers, four amazing sisters by beautiful marriages, 5 nieces and nephews) mean the world to her. After a healthy pregnancy and delivery, Jeni started having symptoms of a numb right leg and severe pain in her lower back and hip bones when Bentley was about 7 weeks old. Doctors, physical therapists, and chiropractors thought the agitations were normal post baby symptoms and nothing of immediate concern. After returning to work 12 weeks post baby, Jeni’s speech began to slur so she saw a new primary care doctor who recommended having MRIs of the brain. Before the referral for MRIs were scheduled, her speech became increasingly worse so she went in to the Integris Edmond Emergency Room on May 9, 2016 to ensure she wasn’t having mini seizures or strokes. After same day CT scans and MRIs, it was confirmed that Jeni had 18 masses in her brain. She was transferred to OKC’s Mercy Hospital’s Neuro Unit where they did further abdominal region scans finding more masses throughout her liver, ribs, and hip bones. After a liver biopsy and a long couple of days filled with MANY-medical-scenario discussions, Jeni was diagnosed with Stage 4 Adenocarcinoma cancer originating in the lung on May 12, 2016. PET Scans showed this glandular cancer had spread through the blood from the lung to her liver, bones, bone marrow, lymph nodes, spinal cord, and brain. After receiving the diagnosis and recommended plan from the Mercy Hospital oncology team, Jeni and her family sought a second opinion at the OU Stephenson Cancer Center. Because Jeni had visited the facility in graduate school on a field trip in 2013 and has worked and volunteered with their Community Outreach Liaison Ashley Watts, she was familiar with the center’s cancer specialists and got in for a second opinion on May 13, 2016. Since then, Jeni has been gifted with an incredible team of doctors at OKC’s OU Medical Center and the Mayo Clinic in Rochester. She has completed 15 days of radiation treating the cancerous spots on major organs and is about to begin her systemic treatment, which is a targeted therapy daily pill (Tarceva) that will target her specific cancer cells. This is not a general “chemo” because Jeni has a genetic mutation (EGFR) that allows for the targeted therapy to work against only the cancer cells rather than all cells. This treatment has had major success over the last few years. Although Jeni originally qualified for a clinical trial out of Yale University that involved the systemic treatment plus a new infusion drug being tested, she has since been taken out of the opportunity because of new medical complications with low platelet counts (46k when normal is 140k-500K) and found two blood clots in veins in her lower legs. These two medical conditions were found by a new doctor who was placed in Jeni’s path on June 9, 2016 who was supposed to execute another liver biopsy for the clinical trial to have more cells for pathology reports. Had this doctor not followed policies and procedures like he did and taken interest in Jeni’s swollen legs/ankles and pain, a simple liver biopsy could have resulted in a dangerous outcome. For Jeni’s health and safety, a new plan was made with her whole team of doctors and on June 10, 2016 she underwent surgery where she received an IVC filter below her lungs and heart to prevent blood clot complications (like a pulmonary embolism) as she was not a candidate for a platelet transfusion, and normal blood thinners with a such a low platelet count wasn’t an option. The IVC filter can come out in the future when platelet counts come back up and her body can go on simple blood thinners. Jeni’s doctors confirm that there is no known cure for her type of cancer but they maintain that there is much hope in containing the cancer through the targeted therapy. Her and her family stand strong in their Christian faith that there is a bigger plan than what they can see in the moment and are in constant awe of all the love, support, and continual prayers that have come their way since the beginning of May. The Kern and Bruns families ask for continued prayers over anything else. Jeni and Adam's Senior Pastor Craig Groeschel recently talked about (in different but always relevant content) how praying might not always change the situation but it ALWAYS changes us. For updates on Jeni's journey please visit www.jenistrong.com. Your love and support mean everything to Jeni and her family. Thank you from the bottom of our hearts. In less than 48 hours, you have surpassed our initial goal! The family has been overwhelmed by your generosity, kind words, and prayers. Jeni's mom is working on an update on treatment for all of you, and will be posting this soon. Before she does so, I wanted to let you all know that we will be increasing the initial goal from 10k to 50k. We thought 10k was an unreachable goal, but you've proven us wrong! And seeing as the cost to battle cancer is far greater than this initial sum, we want to allow you the opportunity to continue to give as you are able. We are so very thankful that the Bruns family has allowed us to fight for them in this way. We hope that you will continue to keep those encouraging words coming, and that you will continue to lift this family up in prayer. You were always the sweetest most amazing person at Cheesecake. You bring so much sunshine wherever you go. I am so glad we met. Sending many warm wishes and prayers your way.